Chicken and rice is a popular combination. In fact, some people would say it’s unbeatable. This simple pairing has been around for ages. After all, rice is a staple in many countries around the world, and chicken is probably more widely available than any other meat. The two go together like spaghetti and meatballs, or peanut butter and jelly. 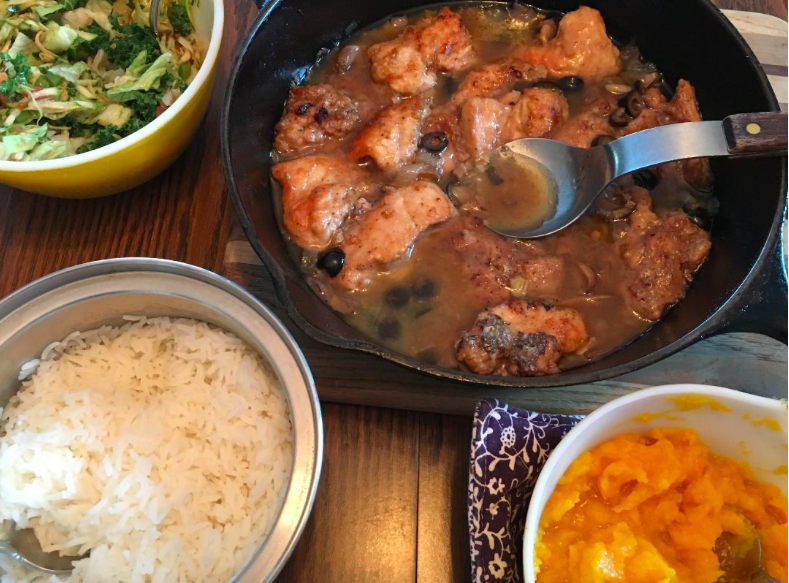 Recently, we had chicken and rice, using a recipe that originally called for pheasant. It was so tasty that I duplicated the meal only a week or so after the first time we had it. One of the things that we particularly liked was the sauce, a rich combination of butter, olive oil, wine and broth, along with a dab of sugar. And I should mention the meat was very tender, probably because it was browned first before being place in the oven with the sautéed mushrooms, onions, garlic and black olives. A nice salad and some home-grown buttercup squash rounded out our meal, which complemented the chicken and rice nicely. In a large heavy skillet, preheat the shortening and butter on medium-high heat. In a bowl, add the flour with the garlic powder and onion powder, seasoning salt and pepper. Roll the pheasant pieces into the seasoned flour and place slowly in the hot pan. Fry until light golden brown. Lightly spray a slow cooker crock with vegetable oil and set the heat to low, and add the browned pheasant pieces. In the heavy skillet that the pheasant was browned in, add the garlic, mushrooms, black olives, wine, onions, sugar, and broth. Heat until it starts to bubble and cook for a few minutes. Pour this sauce over the pheasant in the slow cooker. Cook for 6 to 8 hours. If you wish, you may bake this in the oven on 325 degrees for 1½ hours.